Is Social Media just a fad? Is it the way of communication for the future? Can we claim that the presence of innovative online communication will bring about an end to poverty for West Australians? MIDLAS is creating a collaborative network of not for profit organisations to share information as an online community to push the boundaries of this new frontier. Midland Information Debt & Legal Advocacy Service Inc (MIDLAS) is a Community Legal Centre located in Midland providing free professional services to empower disadvantaged and vulnerable members of the north east of Perth so they can improve their lives. 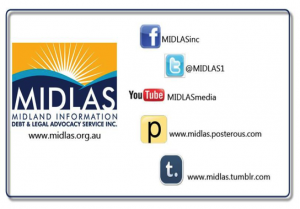 MIDLAS is engaging our community through social media, providing up to date and relevant information and options to current and potential clients through our website and social media platforms. Social media is an extremely effective way to communicate. As print media communicates to their readership via physical newspapers and articles, social media is the vehicle now used for people to virtually communicate with each other. For community based organisations social media provides an opportunity to connect with other organisations, networks, and most importantly with clients. The online platform shares information, content, current trends and education tools. 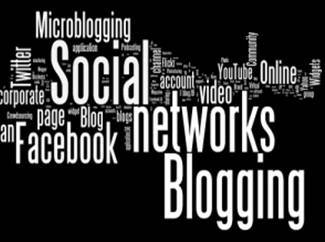 MIDLAS currently engages with a number of social media platforms. Each platform focuses on unique information sharing and when seamlessly integrated through the website a distinctive experience is created. The array of MIDLAS social media platforms can be viewed by following the links below or typing the word MIDLAS into any search engine.